Florynce Kennedy Esq. – African American History Month 2019 #BlackHistoryMonth « Adafruit Industries – Makers, hackers, artists, designers and engineers! 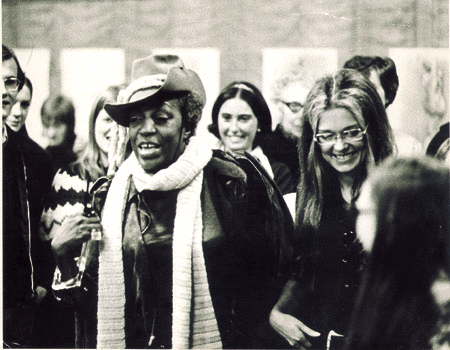 Today we’re honoring activist, author, civil rights advocate, feminist and lawyer Florynce Kennedy. Just one glimpse at the main photo on Florynce Kennedy’s Wikipedia page is enough to inspire a deep dive into learning as much about Florynce Kennedy as possible. By the time I met her in 1969, she had become well known as a founder of the National Organization for Women–though, characteristically, she had left to form other feminist groups when NOW’s rough early days were over and the going got too tame. Because we both wanted to emphasize racism and sexism as parallel problems of caste, we ended up speaking together in what Flo referred to as our “Topsy and Little Eva” team. Several times each month, we would go off to campuses and communities in Texas or Michigan or Oregon, with Flo describing herself as “tired and middle-aged” as I tried to keep up with her energetic, nonstop, and generous-hearted pace.